Are you ready for another football league? Is this one worth watching? 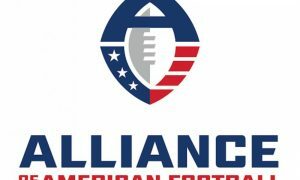 Read why this reporter thinks you’ll like this new AAF league. If you’re an absolute football junkie, of course the answer is yes. If you’re a casual fan of the game, the answer may be yes. If you’re an Alabama fan, the answer is of course yes, you want to pull for boys who once sported the Crimson and White. If you’re just curious, then too, the answer is yes. That obviously was felt throughout the US as expectations on viewership were low, but CBS was proud to say that about three million viewers agreed that it was in fact, worth watching. Local bars were getting lots of phone calls wanting to know if the game was going to be on there as well, which is always a good sign. By the way, it may be worth noting that CBS’s football beat the NBA on ABC by almost half a million viewers, so there’s that too. Saturday’s opening week the CBS game in this area was the Orlando Apollos vs the Atlanta Legends. 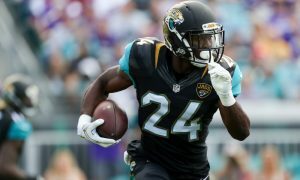 While the game became a blowout in the end, the game was entertaining just to see the rules that are unique for the AAF, some players getting a valuable second chance and to see the Old Ball Coach, Steve Spurrier work his magic once again by calling plays like he used to at Florida. Viewers on the West Coast saw the San Antonio Commanders sink the San Diego fleet 15-6. So while some teams had a little time getting the offense going, it was still entertaining. For an opening week with much less build up of practice season time and few preseason games, the East Coast game was less mistake free than one may have imagined. At least the Apollos made it look that way as they won their opening contest 40-6. As for Sunday’s big game, Birmingham spanked Memphis 26-0 in a defensive jewel of a game. 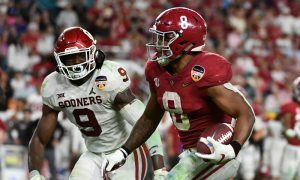 Bama fans didn’t get to see Sims and Richardson, though starting very slow, appeared to get his legs under him in the second half and began to show a glimmer of hope in his comeback attempt. He scored a short TD run, caught a 2 point conversion score and moved the pile for an important clock draining first down late in the game. Statistically, it wasn’t glamorous for Richardson, but you could see him gaining confidence after a first half fumble. 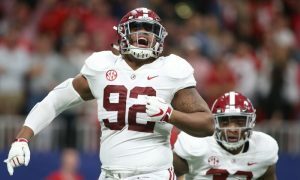 For the Iron though, it was the defense that shined and few shined brighter than former Tide linebacker Xzavier Dickson who picked of a pass and was a force to deal with all game long. 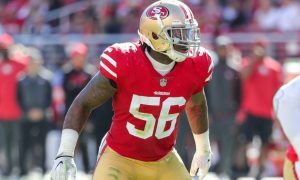 Many of us in the press knew that the defense would shine brightest early on as it takes a bit more time for an offense to gel and find their rhythm and so far, for most teams, that seems to be the case. As for the rule changes, they are numerous, but you should learn them for yourself by watching and we won’t go into all those, but all things considered, they didn’t affect the game as much as one would think and the game did move along a bit more rapidly. 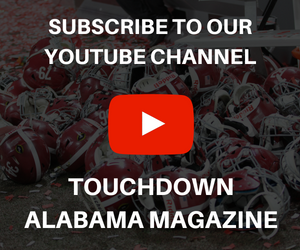 For Alabama fans, many will watch to see how Blake Sims does at the next level at quarterback, if he ever gets the shot to play. Nick Perez started today for the Iron and looked impressive. But most want to see if Trent Richardson can revive a career that steered itself in the ditch in the NFL. Cole Maaza will see if he can keep his perfect long snapping streak going as he did for Alabama. J.C. Hassenauer will be snapping the ball on regular downs and Dominick Jackson, Korren Kirven and Brandon Greene will try and protect the QB while playing on the offensive line. 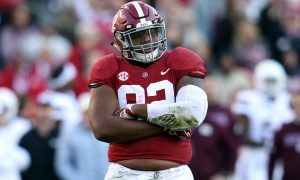 On defense, Tide fans can watch for Josh Frazier at defensive tackle, Xzavier Dickson at linebacker and speedster Bradley Sylve will again be at defensive back. That alone should provide enough enticement to at least give them an initial look and that is what the AAF was thinking by putting lots of regional players on teams that play in that region. 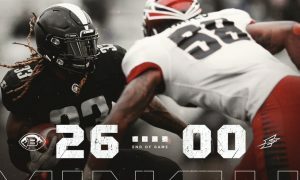 This Birmingham Iron team has players from Auburn, Troy, Samford, South Alabama and Tuskegee too, so there is definitely a strong Alabama flavor to it. 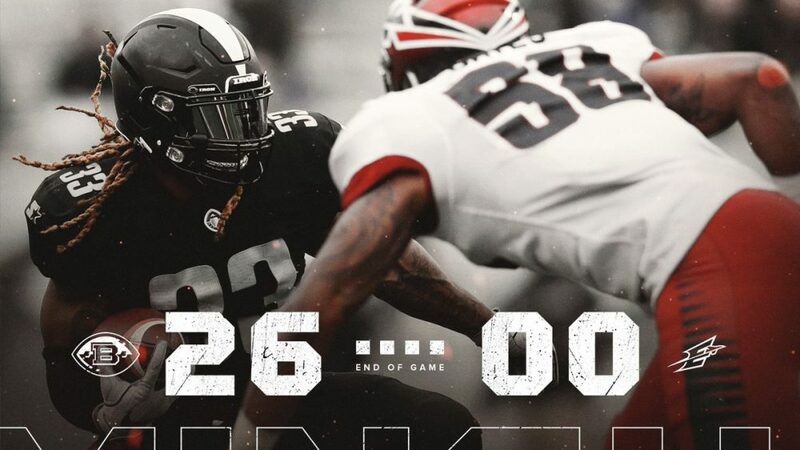 The AAF was hoping this would initially get eyes on the game and that a sense of loyalty and fans would build from there. As long as they don’t kneel for the National Anthem and such controversy won’t be dealt with in this league according to officials. So even folks that have turned of the NFL for those reasons may give this league a shot. As for this writer, I’ll keep watching it.